Amazon's Fire tablets have been incredibly popular for years, despite the absence of all Google apps and services (officially, anyway). Best Buy currently has the 8-inch and 10-inch Fire tablets on sale, at $49.99 ($30 off) and $99.99 ($50 off), respectively. These are the 'special offers' versions, which means you'll get ads on the lock screen unless you pay an additional $15. The Fire HD 8 has a 1280x800 display, a Mediatek MT8163 processor, 1.5GB of RAM, 16GB of storage with microSD expansion, and dual stereo speakers. The Fire HD 10 has a better 1920x1200 screen, 32GB of expandable storage, a faster Mediatek MT8173 processor, 2GB RAM, and the same dual stereo speakers. Both tablets use Amazon's custom Android fork, Fire OS 5. It only takes a few minutes to sideload the Google Play Store on both tablets, but you might need to register the device ID with Google. 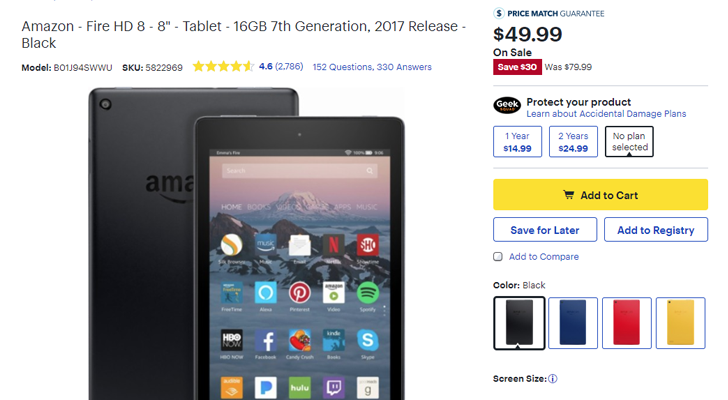 Some variants of the Fire HD 8 and 10 are out of stock on Amazon, so it seems Best Buy is clearing out old stock before refreshed models are released.